Like in speech, a pause can be essential to conveying the importance of a phrase or point in your writing. Because of this, writers should be aware of the differences between the variety of punctuation marks used to show pauses. Two of the most commonly used and misused punctuation marks I see as a creative writing copy editor are ellipses and dashes. Ellipses are a series of three periods that signal the omission of a word, phrase, or more. They are NOT used for a pause. They do NOT replace a comma. Ellipses have two common uses: academic quotes and dialogue. Purposefully oppressive, the vestibule – echoey, claustrophobic . . . At the foot of the staircase the whole thing opens wide, like breath expelled after passing a graveyard (55). The echoey, claustrophobic description goes on for two more lines, and I did not include it because the point I was making had to do with the stairway being gone. I included the ellipse to let my readers know there is more description between the two sentences I quoted. “I assume you encountered them before . . ." The detective’s words trail off. The first example shows the character is continuing to read from a book in class, so the author doesn’t have to write out the whole passage and bore the reader. The second example shows a detective unsure what words to use to describe an event, so he trails off and doesn’t complete the sentence. I follow the Chicago Manual of Style, which means I put spaces between the periods in my ellipses. I prefer this elongated look. However, other style guides do not put spaces between the periods. Both are correct. Authors can choose their style guide, but know that most publishers use Chicago. 555 123 4567 is a list of three different numbers. 555-123-4567 is one phone number. “Open mouthed” means an open mouth. “Open-mouthed” could mean a literal open mouth or it could mean speechlessness, shock, and/or amazed. To create a hyphen, press the minus sign on your keyboard once. A hyphen is not bracketed by spaces. Hyphens are often misused in place of en dashes. Prolific mystery writer Agatha Christie lived from 1890 to 1976. Prolific mystery writer Agatha Christie lived from 1890–1976. The Colorado Rockies won 8–6. The relentless liberal–conservative debates can be exhausting. Denver’s Botanical Gardens are more than a home for hundreds of butterflies, they also contain a large inverte- brate zoo. To create an en dash in Microsoft Word, write the first item being connected, hit the minus sign twice, and write the second item. After you click the spacebar to begin the next word, the two hyphens should automatically combine into a single en dash. Em dashes are the longest of the common dashes (I won’t be covering 2-em and 3-em dashes in this article) and are so named because they are the width of the letter “m.” Em dashes are the most versatile, nuanced, and stylized of the dashes. Whether or not an author chooses to use an em dash is completely up to them and can become a part of their signature. 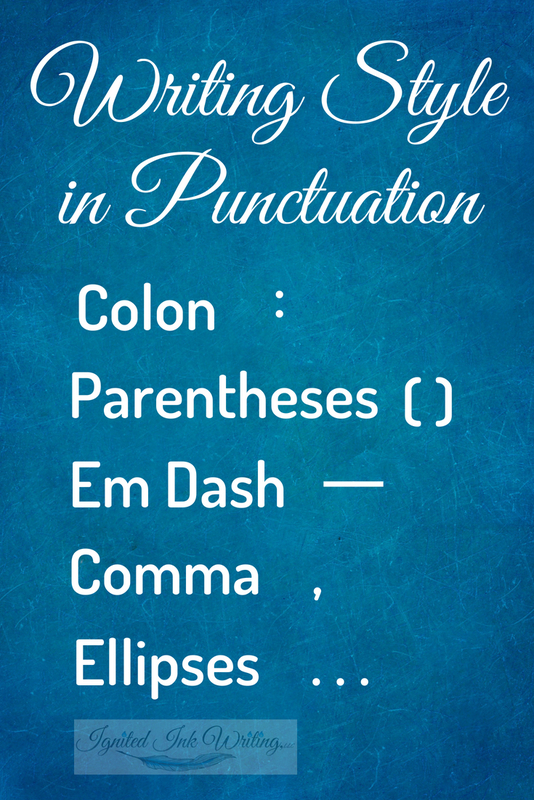 Em dashes can be used instead of parentheses, commas, colons, and ellipses. Colons introduce a restatement, explanation, list/series, or some other amplification of the sentence’s point (to learn more about them read Colons and Semicolons: Not Just for Emojis). Parentheses often offer an aside or explanation of the surrounding text. The type of comma em dashes can replace are also interruptions in the sentence. While hyphens and en dashes form connections, em dashes indicate a break in thought. All of these are best realized through examples. Explanation: Angelo screamed as he passed through the portal and read the card: JINNI. OR Angelo screamed as he passed through the portal and read the card—JINNI. Interruption: She sighed and closed her dark eyes, as if she tried to press the memory of those days of ritual away, something I knew neither of us could do. OR (something I knew neither of us could do). OR —something I knew neither of us could do. Word Replacement: “I assume you encountered them before . . ." OR “I assume you encountered them before—"
He passed through the portal and read the card—JINNI. He passed through the portal and read the card – JINNI. Be aware the en dash used as an em dash is a new writing style and might not be acceptable everywhere. If you’re working with a copy editor, let them know which you prefer. I know punctuation isn’t the most exciting or interesting – for most people – writing topic to study. However, it is vital that writers understand the basics. Even though the majority of the population probably can’t explain what exactly an ellipses represents, they still understand it at a subconscious level. They will recognize when punctuation is being used incorrectly and can become confused or annoyed. Plus, many copy editors charge by the hour. If you understand the rules of grammar and punctuation and make an effort to use them in your writing, you will save money on your copy edits. 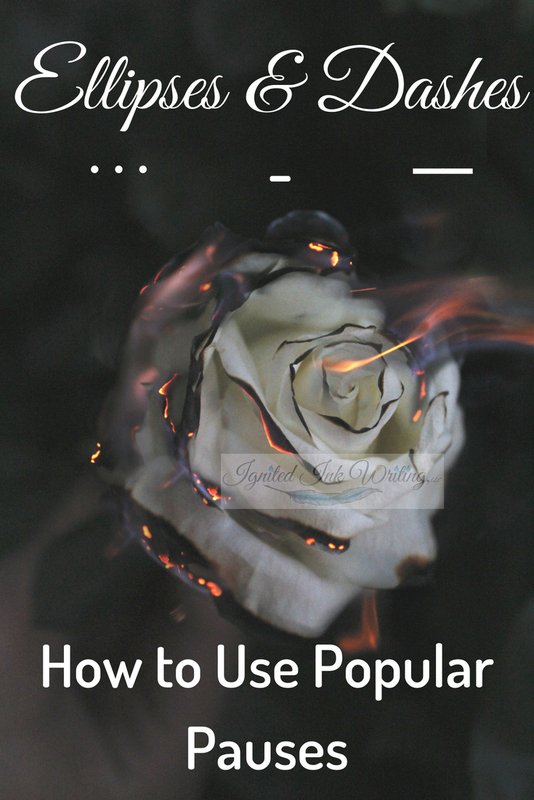 If you’re traditionally publishing, understand agents, acquiring editors, and publishers prefer well-written pieces and have been known to nix submissions for poor punctuation and grammar. Now that you have a better understanding of the uses of ellipses and dashes, it’s time to test them. Try incorporating a few into your current work in progress and see what it does for the story. Experiment to learn how ellipse and dashes can Ignite Your Ink. When do you use ellipses and dashes? Post your answers and any questions in the comments section.